Cold seal packaging may be constructed with two layers of film, as pictured, or with film/paper or paper/paper combinations. Film and paper widths from 4” to 36” can be accommodated and very long lengths are easily cold seal packaged. Product identification is provided by print and apply labeling capability. The versatility of cold seal packaging makes it a popular packaging alternative for replacement parts. There are plenty of types of cold seal packaging available for a wide range of products. 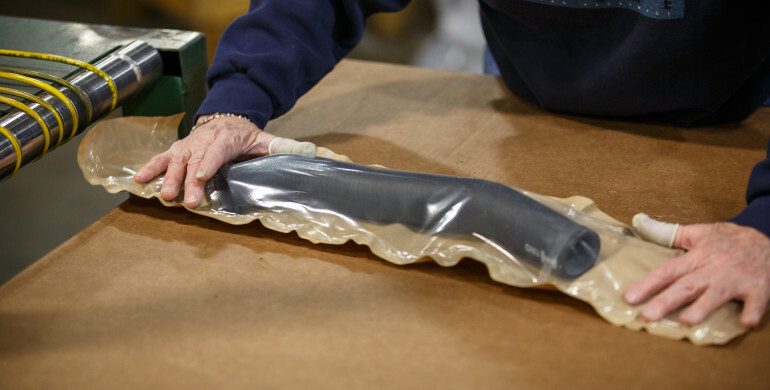 It’s one of the best solutions for many applications for a variety of reasons, keeping products safe from damage that might otherwise occur with other inferior packaging types. What is cold seal packaging? Cold seal packaging, a pressure sensitive adhesive coating on plastic films or laminates, allows packages to be sealed by application of pressure with a seal machine (with no heat or minimal heat). Cold sealing machines do not require any heat, making them much more energy efficient. And the removal of heat from the packaging process eliminates any negative effects it could have on the final result, such as curving, discoloration, or deformation of thermoformed parts. Cold seal packaging also provides potential for significantly more packages per minute with fewer operators, but reducing reject waste, eliminating cold sealing machine start-up times to warm seal jaws, eliminating jaw maintenance, and keeping pace with line speeds even at maximum speeds—there is no loss of seal performance with changing product feed rates. How does cold seal packaging work? A cold seal adhesive is typically printed by gravure at both low and high speeds, on a wide range of substrates. Substrates include paper, aluminum, and coated/uncoated, treated/untreated plastic films. Cold seal technology is based on a coating technique. A water-based emulsion is printed onto a web substrate by means of an engraved gravure cylinder. The key component of the emulsion is natural rubber latex, which provides the cohesive features. These coatings stick preferentially to each other, and almost to no other surfaces. This cold seal adhesive process can create some of the best cold seal packaging for a wide range of products. From automotive parts to aftermarket kits, cold seal system packaging is useful for products across a wide range of industries, giving these items the protection they need during storage and shipping. It’s one of the best ways to maintain product integrity while remaining cost-effective for bulk packaging. Fapco, Inc., is a leader in packaging and parts flow management, and the only flexible packaging partner you need. We are capable of providing you with Aftermarket Kit Packaging Solutions, Automated Parts Kitting, VCI Corrosion Protection Application, Automotive Parts Distribution, Material Flow and Resource Planning, Innovative Shipping Materials, Spare Parts Packaging, Parts Return and Reverse Logistics, Private Label Products, Critical OEM Parts Replacement, ITW Reddi-Pac Packaging Solutions, Tier 1 Automotive Parts Fulfillment, and Just In Time Inventory Warehousing. Your company can focus time, space and resources on your core business, while ensuring the highest levels of support to your customers. We only use the best cold seal packaging equipment to complete each job, which further helps enhance our services and give our clients the best possible results. How can we help grow your business? Let’s get started today with one of our packaging solutions such as our VCI Corrosion or Reverse Logistics. We have the capabilities to meet all of your needs, regardless of the application. We’ll help you design the perfect packaging solution for your products.